Hanuman hug Monkeys are considered reincarnations of the Hindu god Hanuman so Hindus lavish with them with food and offerings and build temples to honor monkeys and Hanuman. Many Buddhists recognize Hindu deities and thus also hold monkeys in high regard. Hindus and Buddhist cherish all living creatures and are reluctant to do any creature any harm. Monkeys are kept as pets and trained to do tricks by street performers. At one time monkey sold for as little as $2 a piece. Often monkeys that have become too big are released by the owners. In many cases they mate with local wild monkeys and produce hybrids and cross breeds. Macaques have thrived in places where they places where they have artificially been introduced by humans. In 1763 a troop of M. sylvanus were released ub Germany where they flourished until they were deliberately exterminated in 1784. There is currently a large free-ranging troop of M. sylvanus in France. M. fascilarus was apparently brought to the Indian Ocean island of Mauritius by Dutch or Portuguese sailors in the 16th century. There are currently about 25,000 to 35,000 of the living on the 1,865 square kilometer island today. M. mulatta lives on Puerto Rico and an island near Rio de Janeiro. A colony of the same species has lived in central Florida since the 1930s when they were probably introduced as a tourist attraction. M. cyclopis has been introduced to the Izu islands south of Tokyo. M. nemestrina has been introduced to Singapore and the Natuna islands. 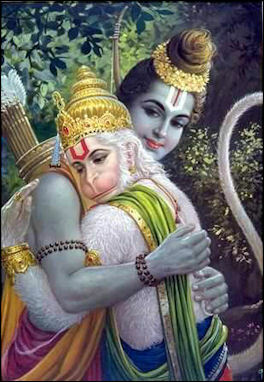 Hanuman, the monkey god and general, is a helper of Rama and popular in villages and rural India. Regarded as brave and loyal, he is worshiped as a symbol of strength and intelligence. He was once associated mostly with Sri Lanka but now is revered all over India as well as in Southeast Asia. Images of Hanuman are often placed at the entrances of temples because of his reputation for fiercely defending his territory against invaders. Hanuman is said to be the son of the wind god Vayi and is well known for his ability to change his appearance. He is often depicted as a warrior hero dressed in armor and carrying a mace and/or a dagger, weapons he used to defeat the demon Ravana, and is frequently connected with Vishnu because of his connection with Rama, one of Vishnu’s incarnations. Hanuman is particularly popular in northern India. In January 1997, when a balloon carrying the adventurer Steve Fosset landed near the northern Indian village of Ninkhar, local people thought the balloon was Hanuman’s floating temple cart. Monkeys are given special respect by Hindus and allow to roam around temples because of their connection with Hanuman. One famous temple in Thailand hosts a huge banquet for monkeys in part to win the approval of Hanuman. Some temples in Asia are occupied by troops of monkeys. Monkeys are often found in the tens of thousands of temples across India. They are seen as a symbol of Hanuman, the mythical monkey god, and devotees visiting temples often feed them. The number of pilgrims visiting monkey temples near national parks have been reduced to twice a week to help protect animals. The Monkey Temple, or Swayamblunath, in Kathmandu is home to brown and pink faced monkeys who some say have occupied the site for 2000 years. The first monkeys that showed up after the temple was built are believed to have arrived from the forest to eat offering left for the gods. With the forest all gone the monkeys rarely venture more than a half mile from the temple and eat offerings of rice, pumpkin and peanuts left for them became they are now considered sacred animals. The monkey population is divided into several troupes. The troops are led by dominant males. They definitely have the run of the temple and the area. They have been known to take candy from children and climb through the windows of nearby guesthouses and steal valuables. Usually the dominate male does the dirty work while the rest of his clan sit and watch. There aren't dangerous or anything, just sneaky. Lop Buri (90 miles north of Bangkok) is an ancient city and home to Pra Prang Sam Yod ("Pagoda with Three Sacred Temples"), which is famous for its large population of pesky monkeys, most of which are a species of macaque called the long-tailed, or cynomolgus, monkey. Many are also rhesus monkey hybrids, which are the result of unions between local monkeys and pet monkeys that have been released after they became to big. Long-tailed macaques that live atop of Wat Prang Sam Top in Lopburi descend from the temple at dawn ro search for food and antics. They fan out in road, causing drivers to swerve and slam on their brakes to avoid hitting them. Some venture into shops and hotels and swing on power lines and have to be shooed away. Occasionally they steal purses and attack people passing by. On a stretch of sidewalk where cycle drivers hang out a meal of fruit and vegetables is left out by an elderly woman. They monkeys squeal and howl and fight for the choicest pieces when the food basket is left out for them. In November, Prang Sam Yoy and Phra Kan Shrines in Lop Buri Wat host a Chinese Banquet for Monkeys, a delectable 10-course, Chinese-style vegetarian banquet enjoyed by 500 monkeys at. Originally sponsored in 1989 by a rich hotel owner who believed that monkeys brought his family good luck, the event is staged at 10:00am, 12:00 noon and 2:00pm. Special gifts including mirrors and toys are presented to the monkeys. The food includes watermelons, pineapples, Thai fruits, corn on the cob and popular desserts and a giant cake. Monkeys are seen downing cans of Pepsi. The monkeys have lived in the Khmer temples of Lop Buri for generations, feasting off the daily offering of fruit left behind by Buddhist worshippers. Known locally as beroks, they can harvest 300 or 400 coconuts in a morning before they tire in the hot sun. They are connected to their human handlers by thin ropes or chains. The best monkeys can harvest 800 coconuts a day and clear a whole grove in a day by leaping 30 feet from tree to tree and tossing down coconuts like cluster bombs. One handler told Smithsonian, "the big males are best for picking from tall trees, where the work is hard. But the males can be difficult to manage; they are strong and have large canines. Young beroks are easier to work with but are not always as productive." Humans are sometimes faster than beroks on a single tree but monkeys have more endurance, they can sometimes leap from tree to tree, and they aren't bothered as much by stinging ants, scorpions and poisonous snakes that often inhabit the top of coconut palms. Monkeys are sometimes employed in the coconut industry to climb up trees and bring down coconuts. The monkeys and their handlers are contracted out by planation owners. They are taught not to bring down any old coconut but only the young ones with tender meat. They are fickle though and won't work when they are tired. Monkeys that respond to voice commands are sometimes used to pick coconuts. Sometimes a owner will get monkeys to work in pairs or teams to bring down hard to reach nuts. Describing a berok named Hitam at work on 80-foot-high trees, Randall Peffer, wrote in Smithsonian magazine, "Led to the first tree, the berok rapidly shins up. Tahar [the handler] lets out coils of leash until the monkey is swaying among the fronds. Almost immediately the tree begins to shake as Hitam struggles to break a coconut from its tough stem. Rustling noises disturb the silence and Tahar moves quickly to dodge the coconuts that suddenly begin to thump on the soft ground around him." "After five or six coconuts are plucked. Tahar tugs on the leash for Hitam to climb down and try the next tree some 25 to 30 feet away. The work is slow; Hitam lacks the speed and strength of larger, more experienced berok." The Malay writer Fatima Busu, once explained, "Beroks are so like us. They can be loving and cooperative but also mean spirited, selfish and lustful. Also very independent. We can love this animal. We can hate it, all at the same time." At home the beroks are kept tethered to poles and are transported from place to pace on platforms on the back of bicycles. Or motorbikes. If a berok falls and breaks a leg it is given a splint, hand feed, bathed by its handler until it recovers. Monkey have been known to protect their handlers from wild dogs and raise a call of alarm when a poisonous snake is near. One handler told Smithsonian, "I give my monkeys affection every day. I sit with them, and we groom one another. We share fruit or walk to the river together to bathe." Sometimes the monkeys are offspring of berok; sometimes they are caught on the forest with nets or traps. Often though, nursing mothers are shot are their babies ate taken. Training the beroks involves patience, persistence, punishment and rewards, mimicry and persuading the monkey that picking coconuts is somehow to his or her advantage. A bond between the trainer and monkey and an understanding of macaque body language and social interaction are necessary. Describing the training of berok by a trainer name Hajee, Peffer wrote: "First the man clips the monkey's wire collar to a leash, holds him close and dangles before him a ripe coconut on a stem and shows the berok how twisting the coconut will make it fall. Next the trainer places the monkey's hand on the coconut, and the monkey imitates what he has just seen. The coconut drops. At the end of the training session, Jajee cuts open the fruit and shares it with the trainee." “On day two the coconut is tied to a low tree. The exercises of the day before are repeated, but this time the monkey has to climb a tree. Successful plucking is rewarded with another coconut feast. On the third day the monkey repeats this lesson and then follows his trainer to a tall palm." Later the monkeys are taught to respond to commands, and pick ripe coconuts using a similar reward system. After a training period of around 20 days, the berok is ready to pick coconuts for five or six hours a day. Since the monkeys make no obvious attempts to count on their fingers and maintain a humble silence in the face of researchers' questions, it remains difficult to pin down the mental tactics they use in determining that, for example, five diamonds represent a lesser quantity than six rectangles. The animals apparently have learned some type of numerical rule for ordering amounts from one to nine, Brannon theorizes. "We don't have direct evidence yet, but it seems likely that these monkeys, and other nonhuman primates, can count," she says. Terrace and Brannon presented two male rhesus monkeys with a series of 35 displays, each consisting of four images, on a touch-sensitive computer screen. Each image portrayed a different object in numbers ranging from one to four. Images were arranged randomly, from left to right. They might show, for example, two bananas, one triangle, four apples, and three hearts. The size, surface area, shape, and color of objects were also changed randomly from one display to the next. The monkeys rapidly learned to touch pictures in ascending numerical order when they received food pellets for correct answers. After errors, the screen turned blank, and a few seconds later, a new set of pictures appeared. A subsequent series of displays presented arrays of four different objects shown in quantities ranging from five to nine. The monkeys ordered these novel amounts as accurately as they had learned to order the smaller numbers of items, the investigators report in the Oct. 23 SCIENCE. In a final trial, the rhesus duo usually distinguished smaller from larger amounts, ranging from one to nine, in pairs of images. The research challenges the prevailing view, which dates to Descartes, that non-human primates cannot think because they cannot use language. It also challenges the views of B.F. Skinner, the noted behaviorist and Terrace's mentor at Harvard, who held that all examples of animal intelligence were simply conditioned behavior that didn't require cognitive explanations. Terrace and Brannon believe that cognitive processes -- thought -- are needed to explain the kind of complex behavior they are studying. They hope to show that human intelligence, like other human attributes, can be traced to animal origins. "We have ample evidence that animals can think without language," said Terrace, who heads Columbia's Primate Cognition Laboratory. "In our current and previous research, we have shown that animals solved complex problems without help from external cues." Added Brannon, "Though monkeys do not recognize the word 'two' or the symbol '2,' they share with humans the capacity to master simple arithmetic, on at least the level of a two-year-old child. We don't have direct evidence yet, but it seems likely that these monkeys, and other non-human primates, can calculate." In a recent series of experiments, Brannon and Terrace trained two male rhesus monkeys, Rosencrantz and Macduff, by presenting them with 35 sets of images on a touch-sensitive video screen. Each picture contained a different number of different objects from one through four, for example, one triangle, two bananas, three hearts and four apples. The stimuli appeared in random positions on the screen, to prevent the monkeys from learning the required sequence as a series of fixed motor movements. Other features of the pictures unrelated to number, such as size, surface area, shape and color, were also varied randomly. When the monkeys touched the pictures in ascending order, i.e., one square, two trees, three ovals and four flowers, they received a banana-flavored food pellet. If they made an error, the screen turned black for several seconds and a new trial began with different pictures. This "video game" paradigm, which the monkeys now clearly enjoy, trained them to perform cognitive serial tasks without verbal instructions -- without language, the researchers said. "It's like using your password to get money from a cash machine, but it's actually much harder for the monkeys," Terrace said. "The pictures, and their position on the screen, change each time they try for another pellet of food. When you go to a cash machine, you don't have to deal with the numbers being in strange positions each time. We ask a lot, cognitively speaking, of our non-human primate subjects." Over the course of learning 35 different training sets, the monkeys got better and better at responding in the ascending numerical order, one to four. The two psychologists then tested Rosencrantz and Macduff on 150 test trials, in which a new stimulus set, showing numbers of objects from five to nine, was presented on each trial. The monkeys performed just as well as they had on the original 35 training sets. "There was no way the monkeys could have done this, unless they had learned some numerical rule for ordering the contents of the pictures," Brannon said. To test whether the monkeys understood the ordinal relations between non-consecutive numbers -- that, for example, five is greater than three -- Brannon and Terrace gave the monkeys a new set of problems in which they were shown up to nine objects. The task was to first touch the picture containing the smaller number of objects, then the one with the larger number of objects. For example, if a monkey was shown one picture with five large circles and another containing seven small circles, the correct order was five, then seven. Rosencrantz and Macduff responded correctly even when the number of objects in the pictures exceeded four. "This finding is important because it shows that monkeys know things about number that we haven't taught them," Brannon said. Brannon and Terrace believe that arithmetic and language evolved separately, and that number skills preceded human speech. "Language is a complex social skill, whereas counting can be learned by the individual," Terrace said. "Counting is useful in foraging for food, assessing a group of predators or ordering the number of dominant males in one's group." Monkey Mind Control -- a Breakthrough for Paralysis? In a leap forward from previous studies, the primates were also able to experience the sense of touch -- a crucial element of any solution for paralyzed people because it enables them to judge the strength used to grasp and control objects. "This was one of the most difficult steps and the fact that we achieved it opens the door to the dream of a person being able to walk again," Miguel Nicolelis, a Brazilian neuroscientist who took part in the study carried out by a team at Duke University in North Carolina. The results suggest it would be possible to create a kind of robotic "exoskeleton" that people could use to feel and sense objects, he said. "The success we've had with primates makes us believe that humans could perform the same tasks much more easily in the future," Nicolelis said. The study was published in the journal Nature. In the first part of the experiment, the rhesus monkeys were rewarded with food for using their hands to control a joystick in search of objects on a computer screen. The joystick was then disconnected, leaving the monkeys to control the movement of a virtual arm on the screen through brain power alone. The Oregon researchers did not transfer the embryos to female monkeys' wombs to grow into full-blown clones, as has been done with several other species. The scientists destroyed them to retrieve the embryonic stem cells growing inside. Those cells can morph into every kind of cell and tissue in the body, and the Oregon team has already coaxed theirs to become monkey nerves and heart cells that spontaneously beat in unison in a lab dish. Because the stem cells were grown from cloned embryos, those cells are genetically matched to the monkey that donated the initial skin cells. That means that any tissues or organs grown from them could be transplanted into that monkey without the need for immune-suppressing drugs. "We only work with monkeys," said Shoukhrat Mitalipov, who led the research at the Oregon National Primate Research Center in Beaverton. "But we hope the technology we developed will be useful for other laboratories working on human subjects." The Oregon team used electrical shocks to fuse skin cells from a 9-year-old rhesus macaque with monkey egg cells whose own DNA had been removed. Perhaps accounting for their ultimate success, the team used a new DNA-removal technique that did not involve the chemical dye usually used to help scientists see the genetic material. They had concluded that the dye was harming the fragile eggs. As is always the case with cloning, fluids in the eggs "reprogrammed" the skin cells' DNA so that the newly fused entities began to divide and grow into embryos. Of 304 efforts, 213 resulted in embryos, of which 35 grew into 5-day-old blastocysts, the stage when stem cells appear. The team fished for stem cells from 20 of those and succeeded in two, for an overall efficiency about the same as is seen with mouse cloning today. Both of those colonies are growing well in lab dishes, Mitalipov said, but one is genetically abnormal. The other is healthy. Attempts to create melded primates have failed in the past, but the scientists in Oregon succeeded by altering the method used to make mice. The breakthrough came when they mixed cells together from very early stage rhesus monkey embryos, in a state known as totipotent, when they are able to give rise to a whole animal as well as the placenta and other life-sustaining tissues. Scientists have log been able make "knock-out" mice by introducing embryonic stem cells that have been cultured in a lab dish into a mouse embryo, but that method failed in monkeys. Primate embryos do not allow cultured embryonic stem cells to become integrated, as mice do. Combining primate cells apparently requires more potent, early stage cells from a living embryo, said lead researcher Shoukhrat Mitalipov of the Oregon National Primate Research Center. The experiment produced three healthy male rhesus monkeys they named Roku, Hex and Chimero, with gene traits from all of the separate embryos used to meld them. "The cells never fuse, but they stay together and work together to form tissues and organs," said Mitalipov. "The possibilities for science are enormous." The research was first published online ahead of the release of the January 20, 2012 issue of the journal Cell. "We cannot model everything in the mouse," Mitalipov said. "If we want to move stem cell therapies from the lab to clinics and from the mouse to humans, we need to understand what these primate cells can and can't do." Researchers at the same Oregon facility in 2000 created the first genetically modified monkey, ANDi, who was carrying an extra bit of DNA that was inserted while he was an unfertilized egg. That experiment was described in Science in 2001.